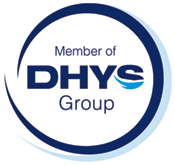 We are a member of the DHYS Group (Distribution in Hygiene Specialist), one of the leading international trade associations for professional hygiene. It currently consists of nine prominent European wholesale groups – GVS Group (Germany), GEH Groupe Europe Hygiène (France), Grupo DINO (Spain), We Italia (Italy), Europap (Slovenia), SOCIUS Network (United Kingdom), Eurosan (Bosnia and Herzegovina), Tapess (Croatia) and Exclusiva (The Netherlands) – with around 140 family-run member companies in 28 countries. DHYS offers internationally active customers the best purchasing options, distribution channels and services when acquiring cleaning and maintenance systems.